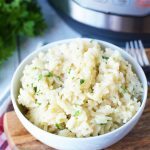 There are a few dishes I have eaten in my life where I fall in love in the first spoonful, risotto was one of these meals. From the minute it hit my lips, I was in love. 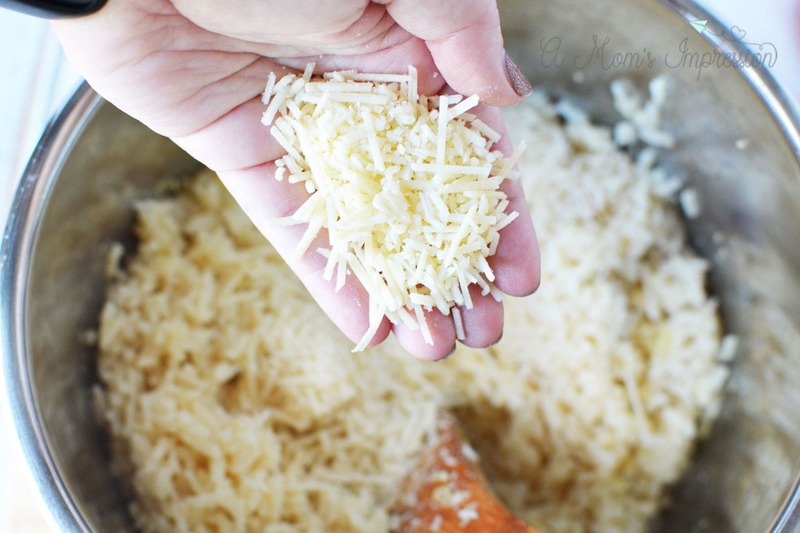 It is no wonder, I can’t seem to get enough parmesan cheese and there aren’t very many rice dishes I don’t like. Most people don’t attempt to make risotto at home, and I can understand why. It is traditionally a dish that takes a lot of time and a lot of care. One ladle of hot broth is added to the rice at a time until it is absorbed and then the process is repeated. The result is a creamy consistency that tastes amazing. What if I told you that you could have the same result with a one button push on your electric pressure cooker? The introduction of the Instant Pot to my life has been life-altering. I have made recipe upon recipe using my pressure cooker with huge successes. I love that it takes sometimes hours off my cooking time, yet it still tastes like it has been cooking all day long like this Instant Pot Chili recipe. I am able to make some of our favorite soups like this Instant Pot Chicken Gnocchi soup. I can also make breakfast and desserts like our Instant Pot Monkey Bread. The culinary range of this appliance is absolutely amazing! 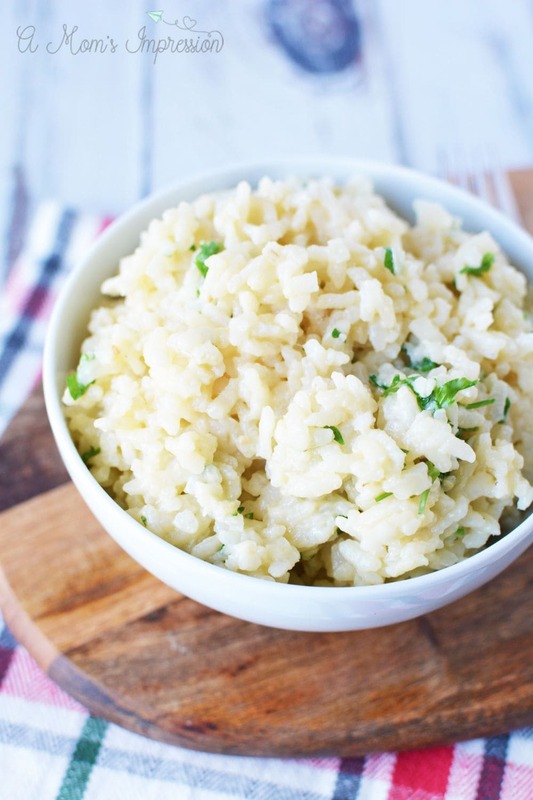 What Rice Should you use for Risotto? It is wise to stick to a short grain rice when making risotto. 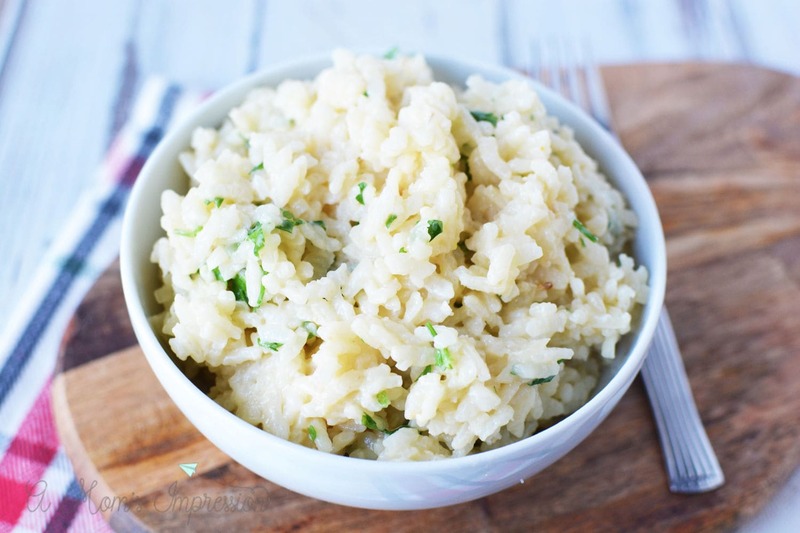 The best type of rice to use is Arborio rice like we did in this recipe. At the grocery store, it might be labeled as risotto rice. If you don’t have any Arborio on hand, you could use paella rice or even sushi rice if that is what you have on hand in your pantry. If you want to make mushroom risotto it is super easy to add your sliced mushrooms in your pot when cooking the onions and garlic. You could also add a protein like chicken, pork, or turkey. Add during the saute phase of cooking and you are good to go. This recipe is best eaten fairly quickly after it is done. Don’t worry, this won’t be too hard as it is delicious and everyone won’t want to wait to try it! You can replace the chicken stock with vegetable stock if you want to make this vegetarian. 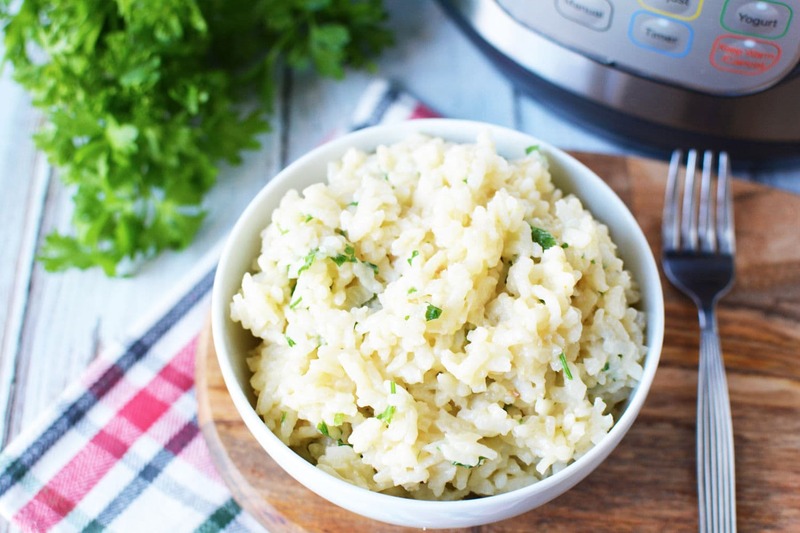 To make this easy risotto recipe I used the “rice” function on my Instant Pot. If your pressure cooker doesn’t have a rice function you can you use Low Pressure for 12 minutes or High Pressure for 6 minutes. Whatever method you choose to cook your risotto under, you will be quickly releasing the steam. Add oil, onion, and garlic to the instant pot and saute until onions are tender and garlic begins to brown. Add broth and rice and mix well. Place lid on the Instant Pot and seal shut. Close pressure release valve. 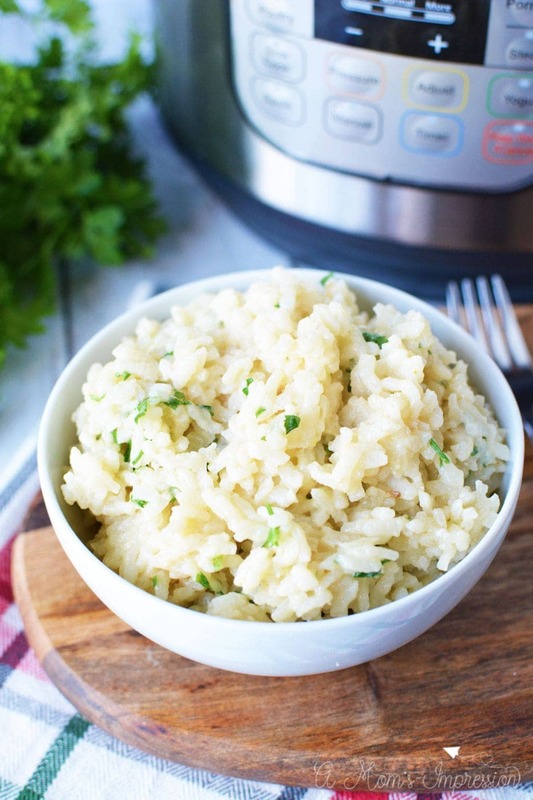 Set instant pot to rice. Once the cooking cycle is complete, quick release steam. Stir in Parmesan Cheese and parsley and enjoy! I used my rice function on my IP and it's set. you cannot change it. It was set to Low Pressure for 12 minutes and it did the excellent cooking this rice. In doing additional research and consulting my manual/recipe book that came with the IP, It looks like you can cook it on Manual, High Pressure for 6 minutes and then Quick Release pressure when cooking is complete. This looks great – do you think you wold have to make any changes if you double the recipe? No, the cooking time and everything would be exactly the same.